Cellular and genetic aspects of atherosclerosis—atherosclerosis is the primary cause of heart attack and stroke, which account for approximately 50% of all deaths and are the leading cause of disability in the United States. Genetic studies involving twin, siblings and families have demonstrated the heritability of atherosclerosis, but the underlying genetic factors remain to be identified. 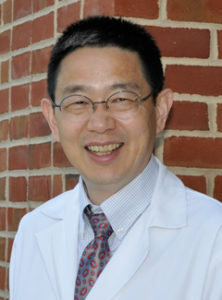 Current research projects involve generation of new genetic crosses to identify quantitative trait loci (QTL) for atherosclerosis and associated traits in mice, evaluation of major QTLs for atherosclerosis by constructing congenic strains, and identification of genes underlying the major QTLs for atherosclerosis. Determinants of neointimal hyperplasia and restenosis (Supported by NIH R01 HL082881 and SIR foundation). Serum amyloid P and noncommunicable disease (supported by NIH Challenge Grant RC1HL100573). Genetic link between hyperglycemia and dyslipidemia. Zhang Z, Rowlan JS, Wang Q, Shi W. Genetic analysis of atherosclerosis and glucose homeostasis in an intercross between C57BL/6 and BALB/cJ apolipoprotein E-deficient mice Circulation: Cardiovasc Genet. 2012;5(2):190-201. Li J, Lu Z, Wang Q, Su Z, Bao Y, Shi W Characterization of Bglu3, a mouse fasting glucose locus, and identification of Apcs as an underlying candidate gene. Physiol Genomics. 2012;44(6):345-51. Li J, Wang Q, Chai W, Chen MH, Liu Z, Shi W. Hyperglycemia in apolipoprotein E-deficient mouse strains with different atherosclerosis susceptibility. Cardiovasc Diabetol. 2011;10:117. Lu Z, Yuan Z, Miyoshi T, Wang Q, Su Z, Chang CC, Shi W. Identification of Soat1 as a Quantitative Trait Locus Gene on Mouse Chromosome 1 Contributing to Hyperlipidemia. PLoS ONE. 2011;6(10): e25344. Manichaikul A, Wang Q, Shi YL, Zhang Z, Leitinger N, Shi W. Characterization ofAth29, a major mouse atherosclerosis susceptibility locus, and identification of Rcn2as a novel regulator of cytokine expression. Am J Physiol Heart Circ Physiol. 2011;301(3):H1056-61. Shi W, Zhang Z, Chen MH, Angle JF, Matsumoto AH. Genes within the MHC region have a dramatic influence on radiation-enhanced atherosclerosis in mice. Circulation: Cardiovascular Genetics. 2010;3:409-413. Yuan Z, Pei H, Roberts DJ, Zhang Z, Rowlan JS, Matsumoto AH, Shi W. Quantitative trait locus analysis of neointimal formation in an intercross between C57BL/6 and C3H/HeJ apolipoprotein E-deficient mice. Circulation: Cardiovascular Genetics.2009;2:220–228. Yuan Z, Miyoshi T, Bao Y, Sheehan JP, Matsumoto AH, Shi W. Microarray analysis of gene expression in the mouse aorta reveals role of the calcium signaling pathway in control of atherosclerosis susceptibility. Am J Physiol Heart Circ Physiol. 2009;296:H1336-H1343. Yuan Z, Su Z, Miyoshi T, Rowlan JS, Shi W. Quantitative trait locus analysis of circulating adhesion molecules in hyperlipidemic apolipoprotein E-deficient mice. Mol Genet Genomics. 2008;280:375-83. Petersen EJ, Miyoshi T, Yuan Z, Li JZ, Shi W, Angle JF. siRNA silencing reveals role of vascular cell adhesion molecule-1 in vascular smooth muscle cell migration.Atherosclerosis. 2008;198:301-6. Li Y, Gilbert TR, Matsumoto AH, Shi W. Effect of aging on fatty streak formation in a diet-induced mouse model of atherosclerosis. J Vasc Res. 2008;45:205-210. Li Q, Li Y, Zhang Z, Gilbert TR, Matsumoto AH, Dobrin SE, Shi W. Quantitative trait locus analysis of carotid atherosclerosis in an intercross between C57BL/6 and C3H apolipoprotein E-deficient mice. Stroke. 2008;39:166-173. Miyoshi T, Yuan Z, Shi W. Association of a Vcam1 mutation with atherosclerosis susceptibility in diet-induced models of atherosclerosis. Atherosclerosis. 2008;196:234-239. Wang SS, Shi W, Wang X, Velky L, Greenlee S, Wang M, Drake TA, Lusis AJ.Mapping, Genetic Isolation and Characterization of Genetic Loci that Determine Resistance to Atherosclerosis in C3H Mice. Arterioscler Thromb Vasc Biol. 2007;27:2671-6. Wang SS, Schadt EE, Wang H, Wang X, Ingram-Drake L, Shi W, Drake TA, Lusis AJ.Identification of Pathways for Atherosclerosis in Mice Integration of Quantitative Trait Locus Analysis and Global Gene Expression Data. Circ Res. 2007;101:e11-30. Miyoshi T, Matsumoto AH, Shi W. Paradoxical increase in LDL oxidation by endothelial cells from an atherosclerosis-resistant mouse strain. Atherosclerosis. 2007;192:259-65. Pei H, Wang Y, Miyoshi T, Zhang Z, Matsumoto AH, Helm GA, Tellides G, Shi W. Direct evidence for a crucial role of the arterial wall in control of atherosclerosis susceptibility. Circulation. 2006;114:2382-2389. Miyoshi T, Li Y, Shih DM, Wang X, Laubach VE, Matsumoto AH, Helm GA, Lusis AJ,Shi W. Deficiency of inducible NO synthase reduces advanced but not early atherosclerosis in apolipoprotein E-deficient mice. Life Sci. 2006;79:525-531. Miyoshi T, Tian J, Matsumoto, Shi W. Differential Response of Vascular Smooth Muscle Cells to Oxidized LDL in Mouse Strains with Different Atherosclerosis Susceptibility. Atherosclerosis. 2006;189:99-105. Tian J, Pei H, Sanders JM, Sarembock IJ, Angle JF, Matsumoto AH, Helm GA, Shi W.Hyperlipidemia is a major determinant of neointimal formation in LDL receptor-deficient mice. Biochem Biophys Res Commun. 2006;345:1004-1009. Su Z, Li Y, James JC, Matsumoto AH, Helm GA, Shi W. Genetic linkage of plasma glucose, body weight, and serum amyloid-P in an intercross between C57BL/6 and C3H apolipoprotein E-deficient mice. Hum Mol Genet. 2006;15:1650-1658. Su Z, Li Y, James JC, McDuffie M, Matsumoto AH, Helm GA, Lusis AJ, Shi W.Quantitative trait locus analysis of atherosclerosis in an intercross between C57BL/6 and C3H mice carrying the mutant apolipoprotein E gene. Genetics. 2006;172:1799-1807.